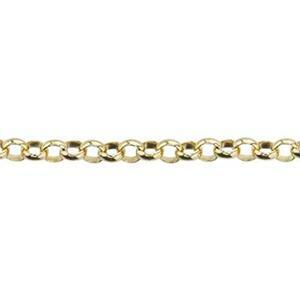 This 1.6mm tiny gold filled rollo chain has a fairy-like flash to it. Deceptively delicate while retaining its strength only adds to this sassy little bulk jewelry chain. Finish with one of our small gold filled lobster claws for a beautiful necklace. A 24 gauge or smaller gauge jump ring will accommodate this chain. If you are not an expert at soldering gold filled - you can finish this chain by using the G20 3 x 6 mm end caps and a gold filled lobster claw or spring ring. Notes: Chain link inner diameter will accommodate 24 gauge jump rings or smaller. Bulk chain is priced per inch. All chains are sold in 12 inch minimum quantities unless a 10 foot minimum is noted. We may use segments of 7 inches or longer to fulfill your order if continuous lengths are not available. Spooled lengths are segmented at the factory so we cannot guarantee continuous lengths of any specific measure. This is my go-to gold chain.